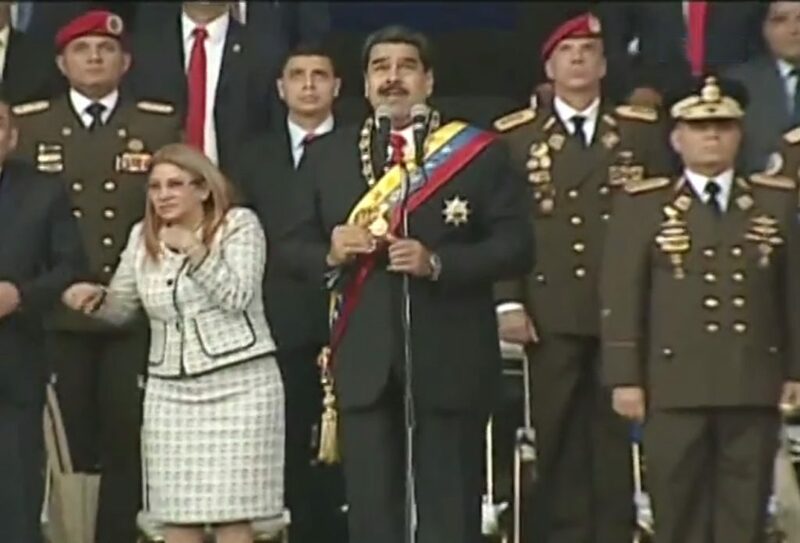 CARACAS, Venezuela (ViaNews) – During the televised commemoration of the 81st birthday of the National Guard with a military parade in downtown Caracas, Venezuelan President Nicolás Maduro was attacked with two drones loaded with explosives near 1700 hours GMT. 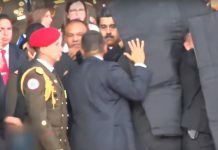 Nicolas Maduro drone attack in Caracas, Venezuela. Nearby residents living more than 1.000 m away, reported having heard loud explosions. 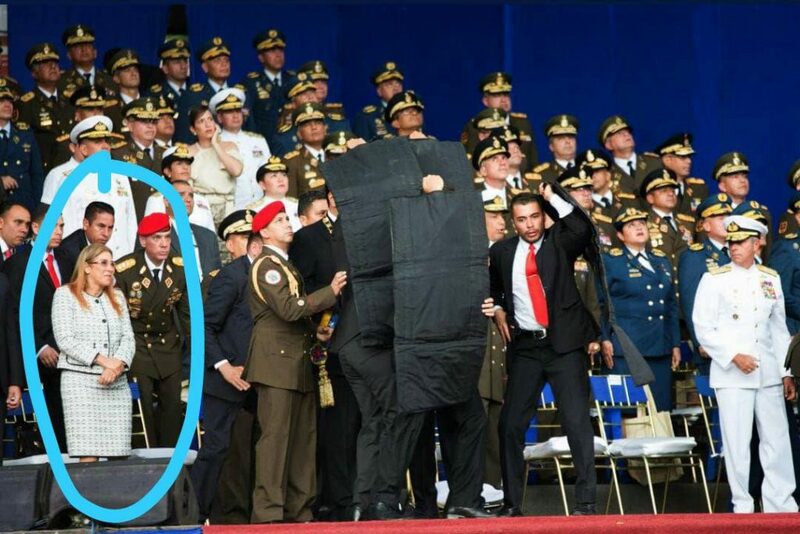 One hour later, Jorge Rodríguez, vice president for Communications and Culture appeared on TV telling the President was safe and sound, and announcing his appearance on radio and TV would happen a few minutes later. 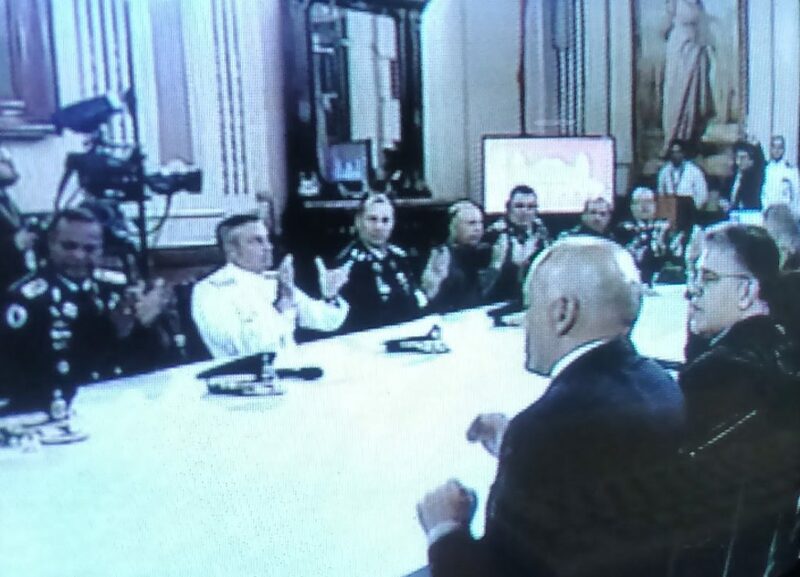 Venezuela’s executive cabinet, TV-broadcast after the drone attack in Caracas. 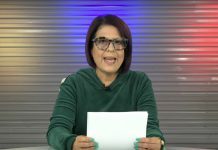 At 20:45 local time the President and most of his cabinet and high ranking militaries appeared on national radio and TV broadcast. Protecting the President behind protecting shields deployed by security. The first lady is in blue circle. 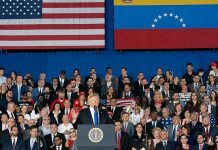 The President said that the frustrated magnicide against him was not a natural behavior of Venezuelan politicians and he pointed against Colombian President, Juan Manuel Santos, who is ending his presidential period next August 7th and wanted to damage Venezuela before leaving. 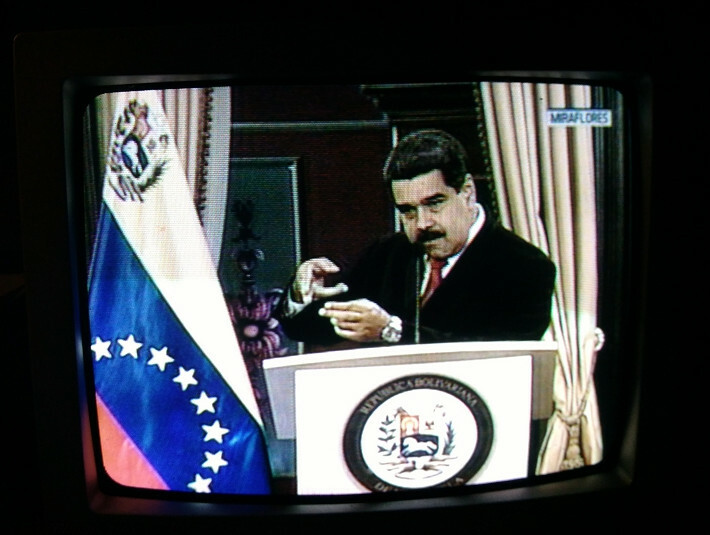 Maduro’s speech after drone attack in Caracas. 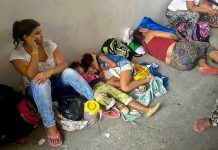 He said that the perpetrators have been caught, and they pointed to intellectual authors and financiers in Bogotá and Miami in alliance with Venezuelan oligarchs. Caracas skyline with smoke from drone explosion. 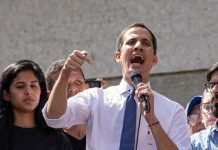 He insisted that those who tried to kill him shall not forget he’s the guarantee of peace in Venezuela and that Venezuelan oligarchs will have to face the millions of people coming down from the workers’ boroughs, should he be killed. 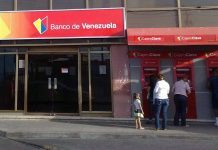 He said he was very confident because he was protected by God, by Venezuelan people, and by the armed force. 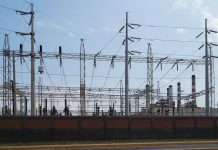 The National Guard is one of the four components of the Venezuelan Armed Force. The National Guard protects the borders from smugglers, and are in charge of public safety during political demonstrations and rallies, as those which took place in April 2017. 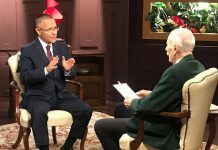 During the Presidential TV broadcasting after the attack, the President said he is now more decided than ever to go ahead with the Bolivarian Revolution. Anti-Plastic Straw Movement Trending In Indonesia, What’s Next?